Sometimes healthy halwa recipes are mind blowing dessert recipe for all those who have sweet tooth. Yes, I do have one at my home. My three years old daughter, Rose. She craves for sweets and desserts recipes all the time. She is a big fan of cake recipes. She used to finish any cakes in one sitting. So I rarely make cakes at home as it is not good for her. I just browse for healthy sweet recipes all the time to make her happy. This is one of that recipe which I made to satisfy my sweet tooth babe. A simple and humble halwa made of fine semolina, milk, ghee and lots of nuts. The traditional recipe for Bombay ice halwa uses cornstarch or cornflour instead of semolina. As this is a healthier version and I am a big fan of semolina recipes, I substitute cornflour with semolina. 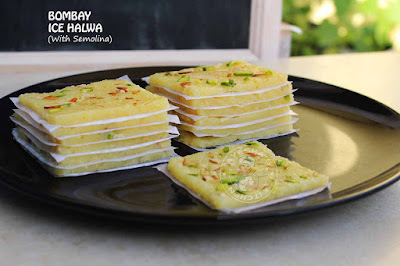 Those who prefer cornflour ice halwa can use cornflour instead of semolina. Thanks, Bhavna's kitchen for sharing such a wonderful recipe. In a bowl, add fine semolina (you must use fine semolina for the best result) and add milk. Let it set aside for 15 minutes. Now pour this mixture into the nonstick pan along with sugar and put on the flame. Immediately add half of the ghee and stir continuously. When it thickens slightly, make the flame to low. Add the food color now and mix well. Add remaining ghee little by little and stir continuously. Stir continuously until you get a smooth un-sticky dough. It will take around 20 minutes. When the mixture leaves from the sides of the pan, then turn off the flame. To know the correct consistency, take a small portion of that mixture and roll it in a steel bowl. When it stops sticking to the bowl and can roll into a ball shape, then it is ready. Switch off the flame and let it cool (it is very important). Once cooled, spread it on a silver foil and roll it using a roller. Sprinkle cardamom powder, nuts and then cover it with a butter paper. Again roll it well until you get a thin halwa. Here I made not too thick nor too thin halwa. Thin halwas looks perfect. So make very thin halwas. After 4 hours, cut them with a knife. Let it dry out completely. Do not refrigerate until dries out completely. Here I just slice them immediately for taking the final pics of the same. You must use fine semolina or rava for this recipe. Cornflour is used in traditional ice halwa recipes. As this is the healthier version, I used semolina instead. You can use the same amount of cornflour instead of semolina. Try to use vegetable ghee without any flavor for making halwa recipes. Once the mixture is ready, roll it using a roller pin only when it is cool. I made here little thick ice halwa. But thin halwa looks perfect. 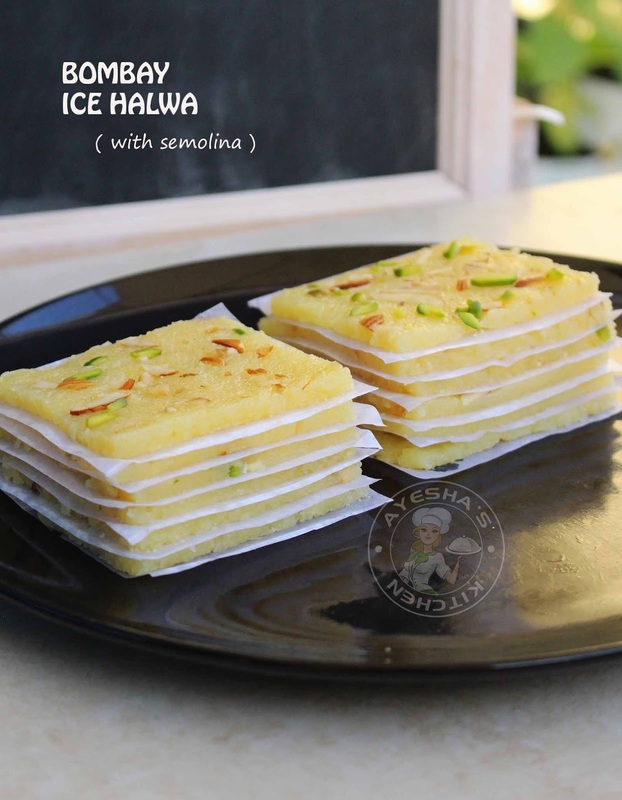 So make your ice halwa thin as possible. I just cut my ice halwa without even wait for at least an hour, for the purpose of taking pics. So I couldn't get the perfect shape. But don't worry still it tastes perfect. So let it set for 4 hours and then cut for a perfect slice.